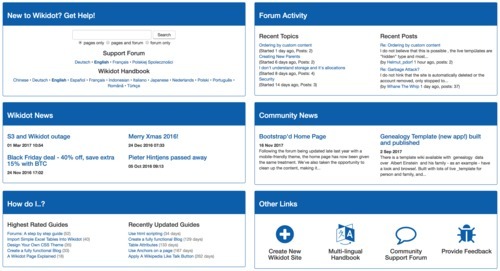 Following the forum being updated late last year with a mobile-friendly theme, the home page has now been given the same treatment. We've also taken the opportunity to clean up the content, making it simpler and straight to the point. Let me know if you have any comments or suggestions! It's possible it will be adjusted slightly over the next few weeks. Great job leiger! The new home screen looks much more clean and readable. This will also be great for mobile users, so that's also pretty cool! Glad you like it Battlesquid. I took a look at your website (battlesquid.wikidot.com) - what's the box on the home page that tracks mouse movement - is it an experiment of yours? I'm testing out the capabilities of the p5.js library. I'm setting out to replace that with an animated slideshow thing (for example, in the background there are bubbles going up, or maybe there are balls bouncing around). The mouse thing is just a placeholder for the actual code that will soon be there. There are a lot of capabilities within p5.js, so wanna test those out! Interesting! Of course, on Wikidot you have access to everything inside the HTML block rather than the entire page, but I look forward to seeing what you come up with. I would like to have seen this type of page as soon as possible and it finally arrived, it was very beautiful, the tonalities of the community and the modernization of the template. Thank you Shane, good job! If you would like to make a site on Wikidot using this theme, you can clone the Standard Template created by Timothy Foster. I've simply pulled out the theme from that template, modified it slightly, and applied it to the community. Most of the initial groundwork was done by Timothy. But I appreciate your comment, knowing that people appreciate the change motivates me to continue upgrading other parts of the community site in my spare time. 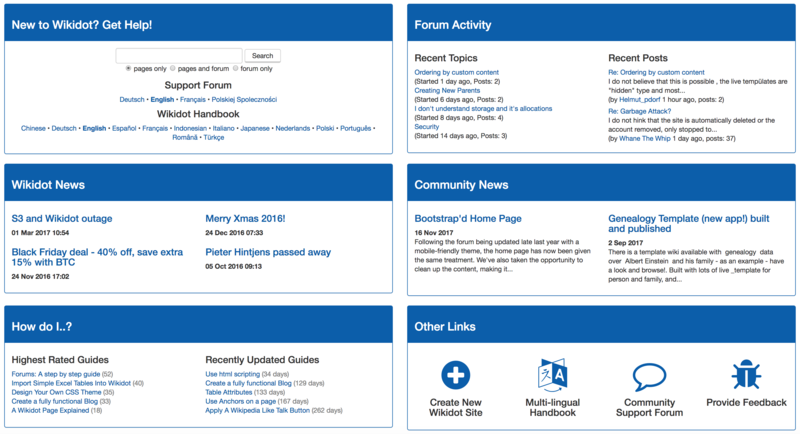 The forum was updated late last year (using another theme from the Standard Template - also by Timothy Foster), and the home page just now. The blog and other sections will undergo the same upgrade in time. It's really an amazing feature. Nowadays everybody navigates using mobiles, and this responsible layout is almost mandatory for websites. However, it is very unfortunate that free accounts in Wikidto can't make use of it. http://standard-template.wikidot.com/ -> Click on "Get Started". http://www.wikidot.com/new-site -> Leave it on the default option (Standard Template) when you create your site. I did that in fact, but the problem was that my old site has some members already. So I need to migrate everybody from one to the other, and of course, migrate all the content. It is giving a lot of work, but it going on..
Hi all, maybe you can help me. I'm using the standard template with modifications in my website (termite.wikido.com). However, I'm with some really annoying buttons, that I can't figure out how to make them behavior normally. Basically, when I pass the mouse on the top of the button, they open a box with the page background. My page is in Portuguese, but if you go in edition box down in the page, and go in files ("Arquivos"), the green buttons "+Opções" and "Enviar um arquivo do seu computador" are having this behaviour. Do you know where in the CSS code I can change this? I already tried !CVBS !ACTA, but I dont know where these buttons are configured. Not sure which phrase you mean , but do you know that most of the wikidot menues and phrases are tranlated by the community ? Have a look - could be there are some buttons "not yet" translated? Perhaps the background-image and height are unintended here? If I take off the background I lose my top header. But thats a minor problem, the height that was really annoying, and taking off that line solved the problem!